Poor Methuselah is having a rough time again. That stuff around him is snow. Since Zoe hasn't felt well, we haven't gone outside to play in the snow. 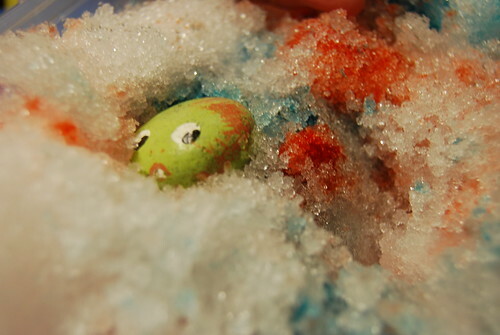 Instead I brought a container of snow inside. First they used watercolors to paint the snow, but they were destroying the brushes. 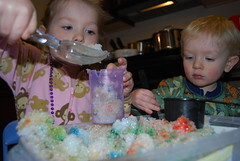 I then added some food coloring to the snow and they dug in it and mixed it and generally had a great time.